This year's Ho Chi Minh Trail tour through the mountains of Central Vietnam was, to say the least, great fun. Including Phong and I in the count, there were six of us riding this somewhat undulating route from the nations hectic capital Hanoi to the beautiful riverside town of Hoi An, some thousand kilometres to the south. The venerable General Arthur, and Kiwi David, both PaintedRoads regulars, were joined by Nicholas and Mark, two chums from the far north of the United Kingdom who’s determination to train for the tour through a bleak Scottish winter can be seen as nothing other than highly commendable. Personally, I enjoyed the tour tremendously. With an overcast sky for 99% of the trip, we were treated to temperatures mostly in the low 20ºs, with the mercury nudging the 30ºs just once so far as I was aware, and even then for less than an hour. To complement the excellent climatic conditions we had a group of people with a similar approach to their cycling, meaning a relaxed bunch with the occasional turn to a light-hearted touch of competitiveness. And when the day’s ride was over, and the chilled beer emerged from the guesthouse fridge, the aprés ride atmosphere was every bit as good as the riding. A fine tour then? I will leave the final word to bicycle tour newcomers Mark and Nicholas. Mark Adams - (47) A portly middle-aged gentleman and recreational cyclist with a penchant for long weekend rides, the occasional Audax, and the odd Sportive. "I don’t do package holidays and hate guided tours. It’s been 25 years since I did either and the memory still grates. My conundrum is I have a window of opportunity for an adventure, no time to plan and a finite window in which to complete it. With a very clear idea of what I want to do and more importantly what I don’t want to do. I take to the internet and find Painted Roads. Point to point cycling in remote terrain travelling through a fascinating country, delivered with a great personal touch from a small independent company - who could ask for more? David, the owner of Painted Roads, cycled every inch of the ride with the group and managed the group in a very non-intrusive way. His light touch allowed the group and individuals to ride their own ride. This allowed the group dynamic to comfortably evolve. This relaxed approach was possible due to David’s extensive efforts in planning the trip, his excellent choice in the local guide and the many years’ experience gained cycle touring and delivering trips in SE Asia. I’m a cyclist and primary goal is to maximise my time in the saddle. I set out with this objective; with no great desire to be ushered from one tourist attraction to the next. Travelling through remote and challenging terrain to roll into a small village allows you to unwittingly immerse yourself in the culture. The flip side is that this requires a degree of patience and expectation management in respect of accommodation. However, this is a compromise that pays back in dividends through the experience gained. The juxtaposition between the time spent on the trip and the post-trip R&R at one of the more popular tourist resorts was stark. This really highlighted the quality of the experience gained by travelling by bike in a small group through towns and villages which have been little impacted by tourism. One of the very many lasting memories of the trip will be rounding a bend on a, particularly long descent to happen upon a troop of baboons crossing the road. My immediate thought was I know the protocol for unwanted attention from dogs, but don’t remember anything in the briefing relating to baboons. I stop, watch then make their way back into the jungle and feel blessed to have encountered them. Having returned home I now long to create the opportunity to join David and Painted Roads on another great adventure. My confidence boosted by the trip down the HCM Trail I’m looking for something bigger, more challenging, more remote … Whatever my next adventure may be, I sincerely hope it is with Painted Roads". Nicholas Croll - Scots man, newcomer to cycle touring, and not afraid of the occasional artic run. 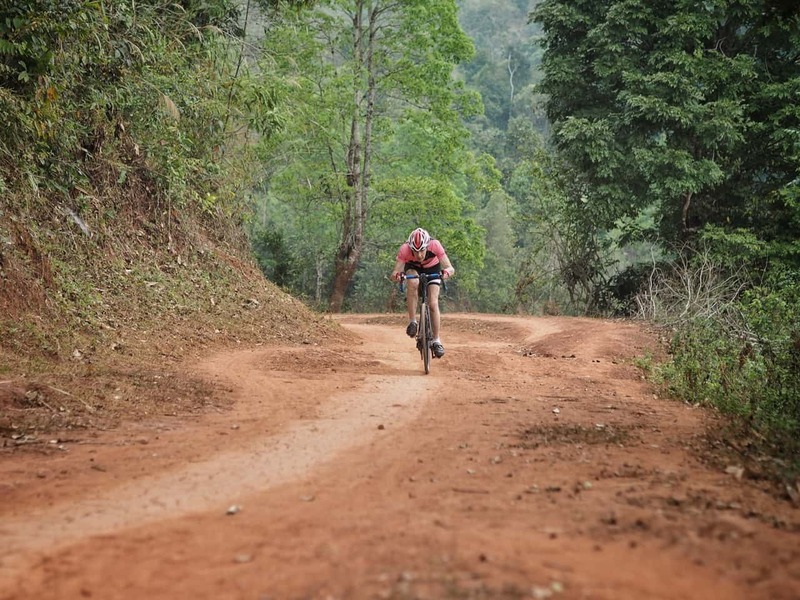 "I undertook my first ever cycle 'holiday' with David Walker/Painted Roads by riding the Ho Chi Minh Trail tour in March 2018. I didn't really have a holiday, instead what I did get was an adventure that far exceeded my expectations and included magnificent scenery, fantastic cycling, great food and top class hospitality. The highest praise I can offer is that the next time I am seeking a cycling 'adventure' my first point of contact will be Painted Roads. Forget the large tour operators for your next cycle tour - choose Painted Roads and you won't have any regrets. Your biggest problem will be deciding which one of the fantastic sounding tours you will take.......good luck!" At 75 you would think he would have slowed down by now - General Arthur could just be the real-life Benjamin Button.